Some time ago we met the son in law of Baron de Driessen in Paris when shopping at the 'poshy' grocery shop in Les Galleries Lafayette. 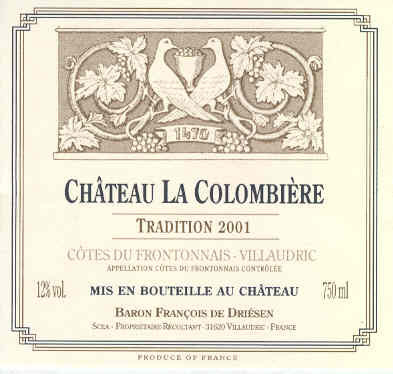 He was promoting the red wine of 2004 from Château la Colombière. This traditional Fronton wine is the best expression of the Négrette, on its terroir of graves, in Villaudric. An expressive nose of prune, black fruits (blackberry), violet and truffle gives a supple, round wine, well-balanced between the fruity and the acidity. The finish is long, minty and spicy with soft tannins. 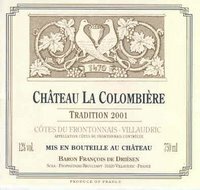 The Château la Colombière is an harmonious wine, which matches with game, white meat, rôtis, traditional French Cuisine or exotic and spicy Cuisine. Only available at the chateau itself or at Galleries Lafayette. When your in Paris anyway, take a detour to the old Opera Garnier and buy a box of wine just around the corner at Lafayette. It's detour worthy!